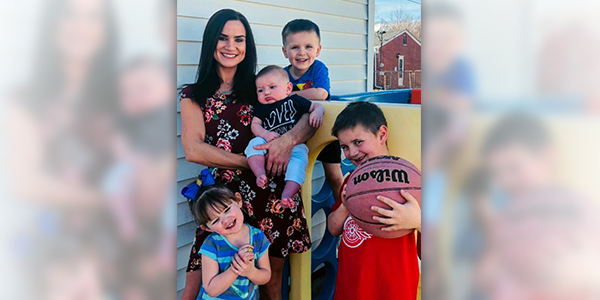 My wife related this morning that my niece, Kendell, wrote this weekend on Facebook inquiring whether she had made a mistake packing away the winter clothes of her four children last week. The week before, the temperatures had been in the 60s. “But is it too soon?” she asked. As if to answer her, today the National Weather Service issued a rare April blizzard warning for Wednesday through Friday for the Midwest. Detroit could be a recipient beginning Thursday. As investors, we have all been caught in the same conundrum. We’ve had a lot of sunny days in the market as it has recovered from its fourth-quarter struggles. The market is now near all-time highs. It’s just 1.3% from the record top in September. It had been one of the worst fourth quarters on record (the worst in seven years). But it was followed by one of the best first quarters ever (the best in almost 10 years). The financial markets are much like the weather. They can change very quickly! As I have written before, when we have these periods of clear days and warm weather in the markets, we must realize that risk is always with us. The trend is always up before the downtrend begins. New highs are welcome but also always turn out to be the beginning of a bear market … eventually. There is no doubt that the stock and bond markets are overbought. Of the three primary drivers of gains on the long side, only gold appears to be below fair value. Yet I believe that this is one of those times when the indexes can be overbought for a fairly long period of time. The averages are only slightly overbought at the one-standard-deviation (SD) level and can easily move into and stay at the two-SD level over the next few weeks before a significant pause. The bullish historical patterns that we talked about last week have continued to multiply. Not only did we get a golden cross on the S&P (forecasting positive annual returns—average: 11.48%, median: 12.39%—the last 10 times since 1990 that it has occurred), but we also generated a tardy but welcome golden cross on the NASDAQ 100. This portends above-average returns for the next one-, three-, and six-month periods, as well as positive annual returns, as have occurred during the last seven instances stretching back to 2004 (average: 12.28%, median: 8.39%). 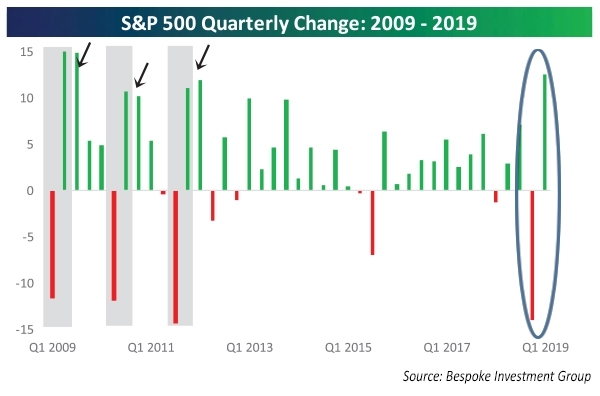 Another pattern: When the market moves up more than 1% on the first trading day of the second quarter (as it did this year), a positive second quarter has usually followed. In fact, of the nine occurrences since 1945, the S&P has been higher eight times, averaging an annual gain of over 21%. April has been a positive month in each instance. This is very similar to the results we reported on last week, which forecast good returns for the quarter following a strong positive quarter, like this year’s first quarter. Economic reports had some positive surprises last week. Housing sales spurred by low mortgage rates continued to improve. The weekly jobless claims total was the best in half a century. And Friday’s employment report recovered from weak numbers last month, posting above-expectation numbers of new jobs with no sign of wage pressure. In addition, if we look at the Bespoke Matrix of Economic Indicators, with Flexible Plan’s inflation adjustment, an interesting trend emerges. While the indicator month-to-month readings certainly bottomed back in October 2018, demonstrating the much-discussed slowdown in the economy, lately the trend to weaker report readings experienced in the early fall and summer have reversed. In just the last four weeks, earnings analysts have downgraded 275 more companies in the S&P 500 Index than they have raised estimates on for the next reporting season, which begins next week. This continues a long-term downward trend. Some may view the continued decline in earnings expectations by analysts as a negative. 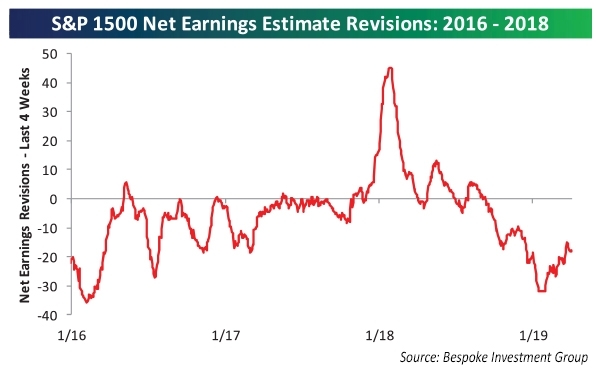 Yet, as we have pointed out in the past, lowered expectations for earnings usually generates a strong market once the earnings reporting commences. The chance of a company outperforming increases as the hurdle is lowered. And if earnings outperform estimates, stocks have historically prospered. 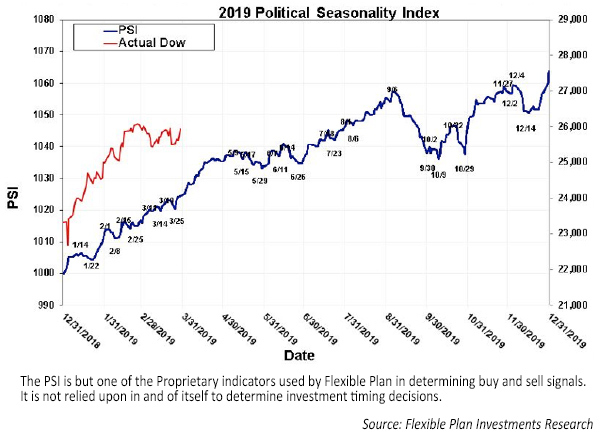 Our Political Seasonality Index (available post-login in our Solution Selector under the Domestic Tactical Equity category) continues to point to higher stock prices as well. Our two current Market Regime indicators—Volatility and All-Terrain—are both in favorable territory. All-Terrain remains in the Normal stage and is friendlier toward stocks than the Volatility regime, which remains High and Falling for the stock, bond, and gold markets. Still, the common strategies for both regimes from their top 10 strategy lists are all equity strategies: QFC Classic, Evolution Plus Aggressive, and Evolution Emerging Markets. Not surprisingly, our equity strategies are mostly fully invested. 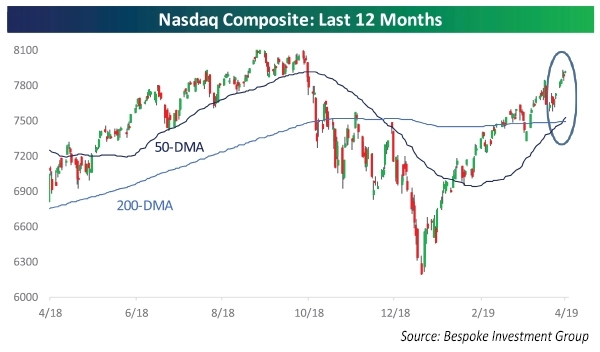 Two exceptions last week were S&P Tactical Patterns (which has recently sold out of a very profitable leveraged equity trade) and Volatility Adjusted NASDAQ (but it moved to a 120% invested position at the close today). It seems clear that the overwhelming evidence is for a continuation of the uptrend at least until a new high is reached. After all, market history tells us that when the S&P 500 is within 2% of its all-time high, it usually takes an average of just 8.5 days for the Index to reach even higher highs. Yet we know that all it takes is a breakdown in the U.S.–China trade negotiations or a spike in inflation when the reports are released Wednesday and Thursday this week for the stock indexes to tumble once again. Risk is always with us. That’s why building a portfolio of dynamic, risk-managed strategies is so important. Investors need an investment plan that not only places them in the market when times are good but also has an exit plan for when times are bad. I’m not talking about a plan to deal with the shallow and short baby bears of up to 20% that happen with relative frequency (two last year) but rather a plan to counter the super bears that can devastate portfolios to the tune of 50% to 70%, like what happened twice in the last decade. History shows that it’s never “too soon” to make that part of your investment planning. 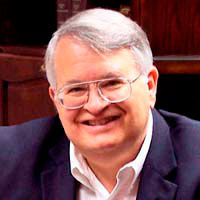 Jerry C. Wagner is Founder and President of Flexible Plan Investments, Ltd. Formerly a tax and securities attorney, Mr. Wagner recognized early on that technology and hedge fund techniques could be applied to help individuals successfully invest, while managing their downside risk. After spending time pioneering new techniques in market analysis, designing quantitative methodologies, and managing investment portfolios, Mr. Wagner founded Flexible Plan Investments in February 1981. PAST PERFORMANCE DOES NOT GUARANTEE FUTURE RESULTS. Inherent in any investment is the potential for loss as well as profit. A list of all recommendations made within the immediately preceding twelve months is available upon written request. Please read Flexible Plan Investments’ Brochure Form ADV Part 2A carefully before investing. View full disclosures.